Active Share - Epoch Investment Partners, Inc. The relative merits of active versus passive investing have been debated for decades and the discussion has intensified with the proliferation of passive approaches and Exchange Traded Funds. There continues to be a broad spectrum of beliefs and practices on the degree to which active management could be successfully applied to portfolios, whose performance is measured relative to the return of a benchmark index after management fees. Asset owners with a multitude of performance objectives face the challenge of evaluating those practices that are expected to reliably deliver the return requirements within the stipulated risk tolerance and cost constraints. How do you measure the degree of active management? The traditional tool that has been applied to assess a portfolio’s degree of active management is ex-post tracking error volatility. Measured as the standard deviation of past excess returns, tracking error volatility provides a useful guide to the likely distribution of excess return outcomes that can reasonably be expected. However, it does not provide direct insights into individual active stock weights at a point in time. Martijn Cremers and Antti Petajisto of the Yale School of Management in a 2006 working paper and 2009 published paper introduced Active Share as a new tool to calculate the degree of active management using active stock weights. The investment community has embraced Active Share since it is an easy to understand holdings-based measure that provides an enhancement over tracking error volatility. In a follow up paper in 2013, Petajisto found that the most active stock pickers outperformed their benchmark indices whereas closet indexers underperformed. This paper discusses Active Share, its usage and limitations along with tracking error volatility in evaluating the management of equity portfolios. We argue that Active Share is a purer gauge of active stock selection, and that despite its correlation high active share does not imply causality of high excess returns. We note Active Share is a differentiator and not a predictor of outperformance or skill, and helps to distinguish the value proposition of closet indexers from that of truly active managers. We believe Active Share by itself does not provide a sense of how a portfolio will behave. Thus Active Share is best used as a supplementary measure in conjunction with tracking error. Together, they provide a fuller picture of the degree to which a portfolio is actively managed and the extent to which the manager is paying attention to the allocation of the portfolio’s active risk budget. Active Share measures how much a portfolio’s holdings differ from the benchmark index member constituents at a point in time. When a manager overweights a stock relative to its weight in the index, there is an active long position. Similarly, when a long-only fund with no leverage underweights a stock or does not hold an index member constituent, it implicitly has an active short position. The summation of all the active long positions and the absolute value of the summation of all the active short positions divided by two (to avoid double counting) gives the percentage Active Share of a portfolio as shown below. Stocks A and B are overweight relative to the index and have an active weights of 14% and 6% respectively. Similarly, Stocks C and D are underweight 5% and 2% respectively, but have absolute values that are positive. The contribution to active weights from Stocks E and F are zero as they are held to index weight. Stock G is not a member constituent of the index but is held at 37% in the portfolio and consequently makes a large contribution to Active Share. Conversely, Stock H represents a large component of the index but is not held in the portfolio and also contributes heavily to Active Share. The sum of the absolute value of the active weights divided by two produces an Active Share of 57%. The higher the Active Share of a portfolio, the greater the degree of active management. An Active Share of 80% suggests that 20% of the capital had an overlap with the index. Note that Active Share is equal to the total of the active long positions and the negative of the active short positions. Active Share can be applied meaningfully to long-only, relative-return equity strategies that aim to outperform a benchmark index. The use of Active Share to evaluate absolute return strategies is less prevalent. Active Share is intuitively appealing and practical, as it is a composite percentage measure of the bet size taken at the stock level relative to an index. Passive managers that aim to fully replicate holdings of the index, by definition, will have an active share equal to 0%. On the other hand, a portfolio with no exposure to index member constituents would have an Active Share of 100%. Active Share of all other strategies ranging from enhanced index to closet index to active strategies to unconstrained concentrated strategies fall in between. Closet indexers would be at the lower end of the acceptable Active Share range as they fear to meaningfully deviate from index holdings for a multitude of reasons and tend to generate index-like returns. 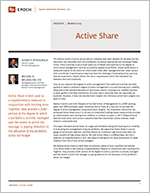 We believe Active Share effectively identifies closet indexers. Asset owners should evaluate closet indexers against the management fees charged to assess their efficacy and value proposition. We believe some care needs to be exercised when interpreting Active Share and users must be cognizant of the following considerations. The structure of a benchmark (number and concentration) affects the computation of Active Share. As such, the performance benchmark selected must be representative of the manager’s natural investment habitat. A benchmark that is inappropriate to a manager’s investment universe could result in misstating Active Share. Further, high Active Share in one universe of equities (S&P 500) is not comparable with Active Share in another universe (Russell 2500) due to different index construction methodologies and practices. Fewer investment choices also limit a manager’s opportunity set and is not comparable with another manager whose universe is broader. Benchmark concentration can also impact Active Share, as active weights of a given portfolio measured relative to a top-heavy concentrated benchmark as opposed to a flatter diversified benchmark can give different Active Share percentages. The weighting scheme applied across the cap spectrum of a portfolio relative to the corresponding index has a major impact on Active Share. Capital allocated by overweighting larger-cap stocks generally produce smaller Active Share relative to the same capital allocated to overweight small and mid-cap stocks. Further, a neutral position in a larger-cap stock in a top-heavy benchmark can produce different Active Share to being neutral a larger-cap stock in a flatter benchmark with a long tail. For example, a neutral position in the largest cap stock in a top-heavy, concentrated index with an index weight of say 15%, would consume more capital (and no contribution to Active Share) than a neutral position in the largest cap stock in a flatter, diversified index with an index weight of say 3%. In the latter case, 12% of capital is available to be deployed to boost Active Share elsewhere. Unconstrained portfolios can be constructed considerably different to a benchmark index. By owning significantly fewer names (high-octane concentrated portfolios) than in the index or by owning non-index stocks, managers can boost Active Share. The popularity of concentrated and unconstrained approaches has partly been due to inherently high Active Share, and the ensuing expectation of higher excess returns. do not believe Active Share by itself is a good determinant of favorable future excess returns or skill. The conclusions from the Cremers and Petajisto work can potentially be misconstrued to mean that high Active Share leads to positive and high excess returns. While there can be a positive correlation between outperformance and high Active Share, there is no evidence to suggest high Active Share causes outperformance. Portfolios constructed by skilled managers are expected to deliver excess returns commensurate with the level of active risk taken. We concur that portfolios with higher Active Share constructed by skilled managers should have the potential to add higher value. Conversely, portfolios with high Active Share constructed by unskilled managers can detract value. Thus higher Active Share should be interpreted as having the potential to generate a wider band of excess return outcomes, both positive and negative. Ultimately it is a manager’s skill, not the fact that they take higher bets, that lead managers to outperform less skilled managers. Skilled managers can also construct low Active Share strategies and still deliver high information ratios, the measure of excess return per unit of active risk taken. Aside from skill, a precondition for outperformance is the degree of individual stock return dispersion during a given period of time. Sufficient return dispersion is a prerequisite as it represents the opportunity to add value through active stock selection. In the extreme, if there was no dispersion in stock returns, and all stocks performed equally, say 20% during that year, then the opportunity to outperform does not exist. Conversely, if there has been wide return dispersion, say between -20% and +20% during that year, managers have a greater opportunity to demonstrate superior stock selection skills. As a holdings-based measure, Active Share does not shed light on portfolio risk to assess the efficiency of the tradeoff between risk and return or active risk and active return (Information Ratio). As such, Active Share by itself does not provide a sense of how a portfolio will behave going forward. Active Share measures the proportion of a portfolio’s holdings that differ from the benchmark index at a point in time. Ex-post tracking error is a returns-based volatility measure that calculates the standard deviation of excess returns over a period of time. The decomposition of tracking error volatility provides insights into how a manager chooses to spend the active risk budget amongst its constituent components. Large common factor bets, whether sector, country or currency leads to higher tracking error volatility. It is noteworthy that portfolios constructed with high Active Share but low tracking error are highly active. These managers have controlled for the risks they have little insight into and have allocated the active risk budget to where their skill is — in stock selection. Similar to higher Active Share, higher tracking error volatility should also be interpreted as having the potential to generate a wider band of excess return outcomes, both positive and negative. Long-term investors with low name turnover and flows are able to maintain a relatively stable Active Share over time. Tracking error volatility however need not be stable over time, as market volatility, which is outside the control of the asset manager, can impact portfolio tracking error. For example, a low volatility environment can translate to low tracking error even with no change to Active Share. Tracking error volatility serves well as a measure of factor bets while Active Share is a good gauge of stock selection. Active Share and outperformance can be correlated, but does not imply causality of positive excess returns. Higher Active Share, like tracking error volatility, should be interpreted as having the potential to generate a wider band of excess return outcomes, both positive and negative. Active Share is a differentiator and not a predictor of outperformance or skill. Portfolios can be highly active with low tracking error if Active Share is high.